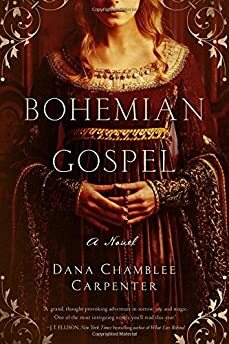 Largehearted Boy: Book Notes - Dana Chamblee Carpenter "Bohemian Gospel"
Book Notes - Dana Chamblee Carpenter "Bohemian Gospel"
Dana Chamblee Carpenter's Bohemian Gospel is an engaging historical novel with a supernatural twist. "Fresh and surprising. There will be some comparisons to Kostova's The Historian, and like that novel, this one does a good job of interweaving history with mythology and the supernatural, offering a new take on somewhat familiar themes." For a historical thriller like Bohemian Gospel, finding music that works to write with is a tricky business. I searched for period music to carry me back in time like my very own T.A.R.D.I.S. and to set the tone, grounding me in the monastic spiritual foundations of the story. But the period and high-church music didn't work for me as I played out key scenes in my mind or developed a character—I needed something vivid to help me pull out the emotional hues of the dramatic centerpieces of the story and something varied to help me understand the complexities of a character. But I don't mind investing the time to find just the right songs. Music travels with me as I journey to discover the story—the wrong companion makes for a miserable trip but the right one can even make waiting on a delayed flight exhilarating. Though jumping from the formal and truncated tunes of the 13th century to the soulful and story-driven songs of today's singer/songwriters did make me wonder a bit about the mental health of my travelling companion . . . and myself. Mouse lived in my head for a year before she told me much about herself. You'll see what I mean when you meet her—she learned early how to keep her secrets. I knew her name (though she and I argued about that) and what she looked like. I saw her first on a battlefield so I used those clues to help me figure out where she belonged, and I knew instantly that there was something very different about her. But I really came to know her through music—mostly as we listened to Laura Marling's Alas I Cannot Swim and I Speak Because I Can. In particular, "Shine" lured Mouse out of her shell and convinced her to trust me with her deepest fears and longed-for wants. The soft vocals are intimate, not threatening, and the guitar runs like a gentle brook in the background coercing the confessional lyrics. The most tender revelation Mouse shared came to me through this song—how she felt about her mentor, Father Lucas. He is an anchor for her throughout her life, guiding her with his wisdom and feeding her a lifeline of hope to sustain her even in her darkest days. The banjo, simple and bright, threads through the highs and lows of the song, and the words give voice to the depth of feelings that so often go unspoken. Mouse feels her way through life, rebelling against convention and expectation and trusting her own instinct and intuition to guide her. When she meets Ottakar, the Younger King of Bohemia, she sees him as he is—someone just like her trying to figure out his place in the world. No barriers of court manners or the distance of social class will keep her from helping him. Or from falling in love with him. This song, a blend of naïve sentiment and haunting loss, is the anthem to Mouse's bittersweet first love. Life's tough in the 13th century, but Mouse never cowers from the battles she has to fight—even when she's sure she's going to lose. She armors herself with the faith that she's fulfilling her destiny by using her special gifts to ease the suffering of others. But the sacrifices she makes hurt all the same. The blues-y rhythms and slurred vocals drip with fatigue and long-suffering hope. I think of this as her eve-of-battle song, her Gethsemane. Mouse isn't the only one who sacrifices and suffers for the greater good. She helps Ottakar struggle through the dark days of recovery after he is victimized by a particularly brutal enemy. The lyrics, the pleading violins, the unrelenting drums in the song speak to Mouse's fierce protectiveness, her sense of responsibility, and the guilt that sometimes threatens to undermine her confidence. The delicate guitar strokes and gentle chords here offer a stark contrast to the lyrics and the vocals—deep and whispered as if the song was almost too heavy to sing. The idea that something could be "too heavy for Superman to lift" and that the only hope is "to hold on as best you can" is agonizing for someone who's already at rock bottom. There's a moment for Mouse, in the quiet of a chapel lit by soft candlelight, when she is given too much to carry. My heart breaks for her, and it breaks anew each time I listen to this song, which played on repeat as I wrote the scene. The clash between the haunting vocals and military-style drum beats that drive this song make a pitch-perfect soundtrack for moments when Mouse and Ottakar are faced with heartbreaking realties. In particular, Mouse makes a decision one night that changes the rest of her life. Her actions are born both from love and rebellion, and like the song, are a last salvo of a woman trying to find victory in surrender. The hardest thing we ask of our heroes is to get back up after they've had everything taken from them. It seems impossible for someone so broken to find the courage to pick up the burden again and move on when they have nothing left to live for. But they do it anyway. Mouse does, too. And she finds a little manna from Heaven along the way. The gospel sounds in this song and Griffin's soulful vocals take us to church, lay us bare, and then send us back out to the battlefield. Sometimes I can't write with vocal music playing—all the words get tumbled around in my head—but these chants slipped into the background like instrumental music, weaving their way into the story as they camouflaged my modern self so I could slip into the monastic life. They set the tone for the spiritual and serene moments in Bohemian Gospel, especially the scenes with Mouse and Father Lucas. Mouse loves to sing and dance so there is quite a bit of music in the book that had to be historically accurate. In my research, I was happy to discover that Ottakar (and his father) loved the troubadour-like songs of the German minnesingers. Additional research led me to the names of the more famous minnesingers, including Neidhart, and translations of their songs. Unlike other modernized versions of medieval music, this album stays true to the nature of the minnesinger's songs. In the novel, this music feeds the scenes of courtly gamesmanship in the Great Hall at the castle in Prague.